Roller Guard Shutters™ are precision engineered to provide protection in a variety of applications. All components are selected for strength, durability, and ease of maintenance. 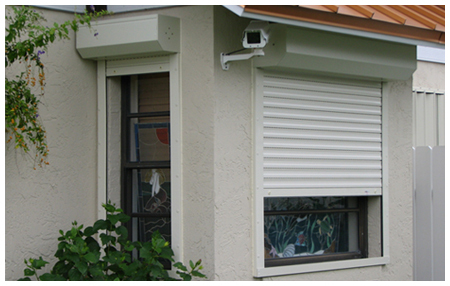 After Roller Guard Shutters™ are installed; you are in control of the outside environment. With the simple push of a button, you are protected from intruders, severe weather conditions, noise, inquisitive neighbors, sunlight, heat, and cold. Roller Guard Shutters™ are designed to protect your property using the finest materials available. In addition, Roller Guard Shutters™ enhance the value of your property by providing additional living space on balconies and patios. These shutters can be installed in the walls, making them invisible until they are needed. Roller Guard Shutters™ are treated with Chromium Phosphate to reduce corrosion and increase longevity. These shutters meet the Dade County Building Codes (the highest standard in the nation), the Florida Building Codes, and the High Velocity Wind Zone codes. Roller Guard Shutters™ include an end retention mechanism which allows unencumbered spans up to 16 feet in length. This allows the shutter to span large windows without support structures interfering with the view!